Find the perfect small wood stove for your living room, cabin, RV, or tiny house today with our complete guide. We've got everything you need to know before you buy and also reviews of the best stoves around. Using a mini wood stove is romantic and nostalgic, but also cheap and incredibly effective. It's a great way of heating a small space like a cabin or tiny house. With a growing demand for small room heaters there has never been a better choice of tiny wood stoves available. They're cheaper than propane heaters, and provide the perfect off-grid heating solution. 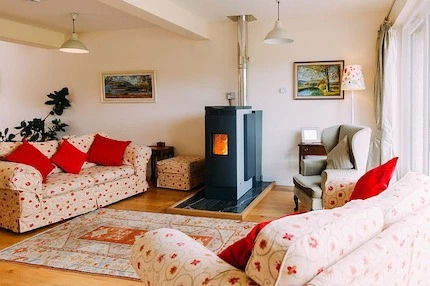 In our guide we'll cover everything you need to know about small wood burning stoves. What size do you need? How should they be installed? We've got all the answers right here. Plus, we list our top 7 wood stoves ready to buy right now. 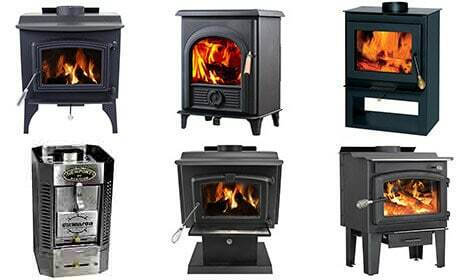 There's a comparison table where you can assess the key features and also more detailed wood stove reviews. We say what we think of each model and why it's deserving of a place on our list. Why Get a Wood Burning Stove? The small space wood stove is more popular than ever because modern designs are much more energy efficient than traditional fireplaces. They produce more energy, and produce less air pollution in doing so. However, like any source of energy, wood burning has its positive points and also its drawbacks. Before we go any further, let's take a look at the real reasons for and against mini wood stoves like these. They can be elegant and create a wonderful atmosphere. It's the prefect off-grid heating solution. The fuel (wood chips, logs, lumber, grass etc.) is easily available. The fuel is renewable and sustainable. The fuel prices are cheap (sometimes free), and stable. The fuel is cheaper than other sources like coal, gas, and oil. The best small wood stoves are now EPA certified to prove they burn efficiently and are not heavy polluters. Small, efficient wood stoves are cleaner burners than oil and coal based systems. Burning wood emits carbon monoxide, nitrogen oxide, and soot into the air. These are hazardous to our health. Modern small wood heaters must meet certain air quality standards. You must make sure you have a carbon monoxide alarm installed. As they require a constant supply of fuel, you must consider the storage space of the wood. Wood comes in many different shapes and sizes, and with different levels of moisture. These all affect how it will burn. This means the consistency of heating might not always be the same. You will need a chimney pipe for the combustion gas. A wood fire must be lit and tended to. Plus, you might need to chop wood too. If you're not an active person then this method of heating might not be for you. Propane heaters are a popular choice for RVs and tiny houses, and there are many good reasons for this. But, like any fuel source there are drawbacks too. Let's see how small log burners compare with the common alternative. To do this we'll see how they differ in 4 key categories. These are: cost, maintenance, environment, and aesthetics. Cost - A key feature in favor of small wood burning stoves is that the cost of wood will always remain low and steady. In fact, for some it will even be free. Compare this with the cost of propane which is dependent on international markets and can fluctuate greatly. Maintenance - This area is where the propane heater really shines. Simply connect the gas canister and you're done until next time. With a wood burning stove you may need to chop your own wood, dry the wood, light a fire, and tend to the fire. This is a lot more labor intensive. Environment - Gas burns cleaner than wood. It emits less soot and air pollution. However, most modern wood burning stoves are EPA certified, which means less smoke and better efficiency than before. Aesthetics - A hands down win for the wood burning heaters. They can transform the mood and ambience of a room or small space. The best wood stoves are classic in design and often the center piece of a room. Recommended Article: Learn all about cheap pellet stoves in our big guide. These units can work really well in tiny houses and small spaces, but they must be installed carefully and safety should be the priority. A wood burning stove will obviously be a fire hazard, but it also emits some potentially deadly gases like carbon monoxide and nitrogen oxide. However, if you follow the recommended installation guidelines you can rest at ease. Here are a few key points that should be considered prior to buying a high efficiency wood stove. Flue - The flue is the chimney which will carry the gases made in the stove out of your home. Consider the heat of the flue pipe, and the path it must take out of your home. The flue pipe must be inspected at regular intervals to make sure it is in good condition. It may also need cleaned from time to time to make sure there is no buildup that could become a fire hazard. Positioning - Installing a tiny house wood stove can be a bit of a headache. It must be clear of any potential fire hazards, and you're not exactly blessed with floor space. The stove manufacturers will provide a recommended clearance distance. Check out the image below for some typical values. Fire Safety - Burning wood produces deadly carbon monoxide gas. Make sure you have a fully operational CO alarm, and that it is tested regularly. Recommended Reading: Increase your stove's heat efficiency with a heat powered fan. It's essential that you check your device regularly to ensure that it is running efficiently, and of course safely. There are a few simple checks that you should do. Here's a brief guideline to maintaining a stove of this kind. The chimney and chimney connector should be checked every month for the first few months, and around every two months thereafter. When wood burns slowly it creates creosote vapors that can cool in the chimney to form a solid build-up. Any creosote build-up should be removed to prevent a fire risk. Check for damages to joints, and the chimney outlet at least twice per year. Gaps can be identified using a dark room and a flashlight. Check that the glass isn't cracked or chipped, and that the seals are good at least twice per year. Gaps in the seals can be found with a flashlight in a dark room. Repairs should be carried out with fire cement, or replacement parts. Check that the stove door seals tightly at least twice per year. You can do this by putting a piece of paper in the door. When pulling the paper out you should feel real resistance. Before you buy a tiny house wood burning stove make sure you're aware of the things that matter. It's important that you get the right stove for your situation. Here's are our 3 point checklist to consider before you buy. 1. If space is tight, make sure you know the recommended clearance distances. The clearance distance is the minimum distance allowed from the stove to the nearest walls. It varies with each model and also changes according to the way that it is placed in a room (will it be placed in a corner or will it be parallel to a wall?). 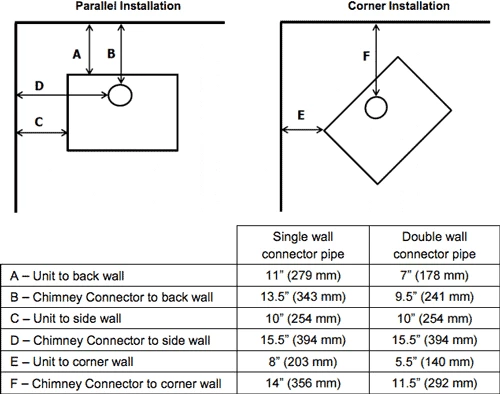 Using a double wall chimney connector, and also using protective materials on the wall can reduce the clearance distances. If space is tight in your tiny house, make sure you can meet the recommended clearance distances before you buy. In no circumstances should you ignore these recommended clearances. They are there to safeguard your home against fire hazards. 2. Is it EPA certified? An EPA certificate means that the wood burner has met certain standards for burn efficiency. This means it will use less fuel to produce heat. It also means it will emit less harmful pollutants into the atmosphere. This is important for the environment, but also because you may be eligible for tax credits. Wood stoves that exceed 75% efficiency may be eligible for a $300 tax credit. 3. How much heating power will you need for your home? The heat that a stove can produce is measured in British Thermal Units (BTU). One BTU is the amount of heat needed to increase the temperature of one pound of water by one degree Fahrenheit. This figure can be misleading when quoted by manufacturers as it is gained under optimal conditions (usually in a lab). But, if conditions are equal between stoves then it's a great comparison tool. Just remember that you'll be hard pushed to replicate these numbers in your home. The average sized home would probably need no more than 20,000 BTUs per hour of continuous heat to stay warm, even in winter time. Even this figure is a maximum one. The average sized house is around 2,600 square feet, while a tiny house would range between 100-400 square feet. Here's our pick of the top small wood stoves for cabins and small homes available right now. Start off with the comparison table below where we've shortlisted our 3 favorite models. There are more detailed reviews of all of our recommendations following the table. 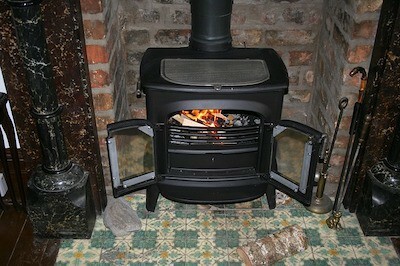 The Shetland is a clever little wood burning stove that looks great too. It features some smart design that means it packs a massive efficiency rating of 85%. This is the highest efficiency rating that we have seen, and it's made even more impressive when you consider that this is one of the smallest wood burning stoves on our list. It produces such a clean burn by using pre-heated tertiary air which gets the very most out of the wood fuel. The higher the burn efficiency the more money you will save on fuel in the long term. The Hi-Flame Shetland will produce up to 21,000 BTU and will heat an area of up to 800 square feet. This makes it the perfect size heater for small homes and cabins. It is small in stature too, and won't take up much space. In fact, there is the option of using a top or rear flue which gives some flexibility over where it is installed. It doesn't need much surface clearance from walls either. A steel rear heat shield gives better air convection and decreases the clearance distance. Besides having some well engineered design features, it also looks great. It's made of furniture quality solid cast iron and has a massive ceramic glass window on the door. The big window gives a great view of the fire, which will improve the atmosphere of any room. The excellent build quality is backed by an impressive 7-year warranty. This is the longest warranty we've encountered in our research and another reason why this stove stands out in a crowded marketplace. Bottom Line: This wood burning stove is awesome and performs on every level. It's extremely efficient, it's really compact, it looks great, and it's a powerful heater for its size. But, it can be considered reasonably expensive. If cost isn't an issue then you'll do very well to find a better small cast iron wood stove. The Vogelzang Defender is our favorite wood burning stove in terms of looks and the overall ambience it creates. It has a huge glass door that allows an amazing view of the fire inside. The Defender is made of plate steel, formed into an air tight finish. It has a pewter and nickel trim and a charcoal black finish. The door is made of heavy cast iron, with a 14.5" x 8" ceramic glass viewing window. The Defender features an innovative way of getting the most possible energy out of the wood that you are burning. There is an air vent at the front of the stove that helps light the fire, and an air inlet at the back that routes air through three tubes directly above the burning wood. These air inlets ensure that the wood burns efficiently. In turn, this means the wood will burn longer, costing you less in fuel expenses. The Defender actually has an EPA certificate for its efficiency in burning. Burn efficiency is incredibly important as it affects how much wood you will need to use and also the emissions that are produced in the combustion process. The Defender will provide up to 68,00 BTUs of heating power. This will comfortably heat areas of up to 1,200 square feet. It also comes with a blower to ensure an even distribution of heat. Whether or not you need the blower depends on the ventilation in your room. The Vogelzang Defender also has adjustable legs. This is a nice feature that means you can give it a bit more clearance from nearby surfaces, or even save a bit more space. Bottom Line: The Defender is another of our favorite wood burning stoves on the list. It has a simple looking design, but that big window really lets the fire provide the highlights. The huge glass window means it can add a lot of atmosphere to your room and will immediately become the centerpiece. It is also really well put together with some nice features to help improve the fire burning efficiency too. Recommended Reading: Our post on cleaning wood stove glass is a must read if you want your stove to stay looking pretty. This Pleasant Hearth burner is an elegant center piece for any room. It has a large glass door that allows the fire to brighten up the room while it is heating it. This stove is capable of heating areas of up to 1,200 square feet in size. By burning wood it can create 50,00 BTUs, which is a lot of heat for a small stove. It is actually big enough to accommodate logs of up to 18 inches in size. It will burn them pretty cleanly too, and is EPA certified with an 81% efficiency rating. This is a clean burning emission standard. It is well put together with features like air wash ventilation, and a brick lined fire box to make sure that it will last the tests of time. It has a blower too that makes sure that the heat is evenly distributed throughout the room. This statistics that we use here all represent the small version of this model. It's actually available in two larger sizes for bigger homes too. Bottom Line: This offering from Pleasant Hearth is an elegant one. It has a huge glass window that lets all the character and atmosphere of a burning fire into your room. The only drawback is the lack of a removable ash tray. This stove from Pleasant Hearth is capable of heating areas of up to 1,200 square feet. This is more than enough heating power for a tiny house or cabin. It is EPA certified, so you can rest assured that it meets all the guidelines with regards to efficient and clean burning. It is rated at 81% for its burn efficiency. This is a really good number for a wood burning stove. It has a firebrick lined interior to improve the quality of the burn, and an air wash system that helps in this area too. Like most Pleasant Hearth stoves it features chrome handles, and a solid cast iron door with a large glass window. The ceramic glass window gives an awesome view of the fire, and helps in adding atmosphere to any room. This model also comes with a limited 5-year warranty and an instructional DVD. The DVD guides you through the installation and maintenance procedures, which can be a bit daunting for the first timer. Bottom Line: This stove burns really well and is EPA certified for its efficiency. It would function really well in most small spaces. The 5-year warranty makes it a pretty safe bet. The finest really small wood stoves are those built for marine use. They must be compact, reliable, and very efficient. The Dickinson Newport is one of these. It is one of the smallest wood burning stoves available, and can even be attached to a wall to save space. It measures just 7.88"(w) x 14.7"(h) x 10"(d) and weighs just 15 lbs. But, despite being small in stature it is still capable of heating 3000-8000 BTU. This figure really depends on the fuel you use, as the Newport is able to handle a variety of solid fuel types. It is capable of using wood, peat, charcoal, and presto log fuel. The Dickinson Newport is designed for use on a 20-25 feet boat. This means it is well suited to heating a small living space like a tiny house. It wouldn't be suited to areas of extreme cold, but would do a decent job of keeping a cabin warm in most climates. It is well made of durable stainless steel. It has a removable ash drawer so that cleaning is easy, and a damper control too. The heater requires a 3" diameter chimney (flue). A minimum of 4 feet of chimney is required, and a straight chimney pipe is desirable. Within the chimney pipe there is another air pipe that feeds the fire. You must make sure that there is a fresh air vent close to the heater too. The Newport is a great fit for cabins, RVs, and small rooms. If you're looking for something a bit bigger, then don't miss the Shetland model that's first on our list. Bottom Line: The fact that this can be mounted on a wall as opposed to on the floor opens up a world of new opportunities to those wanting a wood burning stove, but have little space for it. It's the smallest wood stove that we're aware of. However, this means it's not ideally suited to life in really cold areas or for heating large rooms. This Summer's Heat burner is made in USA with heavy duty steel. It has a heavy duty cast iron door, and quality welded body. It is capable of heating spaces of between 800-1,200 square feet in a really efficient manner. It is EPA certified to produce low emissions at a high level of efficiency. This means it will use less wood to make your room warm. It features a large viewing window made of ceramic glass. The window is cleaned by an air wash system to ensure good visibility at all times. Inside, the firebox is lined so that the combustion is as efficient as possible. This is also helped by custom made convection channels that offer the maximum amount of heat transfer. The stove comes with a blower included at no extra charge. The blower can be added to improve heat distribution throughout the room. It also comes with a choice of handles. Both brass and nickel handles are included with the stove. The stove is shallow in its design, which means it won't take up much space. Despite being shallow it will still take large logs of up to 16 inches in size. Another handy feature that will save space is the storage area underneath for logs to be collected and stored. It will fit a standard 6 inch chimney pipe which should make installation straightforward too. Note: It has recently been reduced in price. Bottom Line: This is a quality small wood stove that makes space a priority. It is shallower than most small stoves, and has a neat storage area for logs under the firebox. If space is tight then this is a great option for your home. A top pick for a tiny house wood burning stove. The EcoZoom Plancha offers something a bit different to the others we have included in our list of the best wood burning stoves. It is unique in our list in that it is primarily designed for cooking but can also be used for keeping a room warm. It has two separate combustion chambers that can be used independently at different heat levels. The chambers can be fueled with wood, charcoal, or biomass and they are fully insulated to retain as much heat as possible when lit. The Plancha has a large cooking surface that heats up evenly. It can be cooked on directly or used with pots and pans. The cooking surface measures 22 x 18 inches and is made of solid cast iron. There are removable lids on the cooking plate that give direct access to the fire beneath. The bottom side of the cast iron griddle is baffled. This helps with circulation and forces smoke out of the chimney. The Plancha comes with an 8 foot chimney, but this can easily be extended or changed to accommodate installation indoors. It is primarily designed for outdoor use, but fits well indoors too. There is a compartment at the back for drying wood that helps to save room in a small space. It really depends on your particular situation as to which model is best for your home, cabin, or RV. If you're working with a really tight space, then the Dickinson Newport deserves your attention. It really is tiny when compared to the other models. You might even call this a micro wood stove! The drawbacks here though are that it will need filled with fuel more often and it just won't provide as much heat as the larger of the small indoor wood stoves. Our absolute favorite is the Hi-Flame Shetland. It's just a great combination of all the things people look for in a small wood burner. The fact that it burns with such high efficiency is the real stand-out feature but it's just a really dependable all-rounder. But, as you know, buying one of these things is a big decision not to be taken lightly. Take your time, get all the facts, and make sure you do your homework on installation and clearance distances. That's our guide to the top tiny house wood stove complete. We hope this post has been of value to you. If you have any questions then don't hesitate to get in contact at the bottom of the page. We'll get back to you promptly. Check back soon as we have lots of new posts and ideas coming in the near future. If you're looking for something even smaller to heat your home then check out our guide to small space heaters. 1: gas may burn cleaner than wood but it is a non-renewable, petrochemical resource that takes far more energy (and creates significant pollutants) to extract, refine, and transport than wood. Taking into account the comprehensive total of the each fuels’ production, distribution and consumption byproducts, wood is by far the greener option. 2. Wood has a closed loop cycle whereby the co2 emitted when burned is used by growing trees. I.E. if you burn an 80 year old tree the co2 is reabsorbed in another 80 years. The co2 released by gas production and use is not recovered by the processes that created the gas on any scale that is reasonable to discuss. Hence, fossil fuels. 3. My experience is that having to locate, chop, stack, and stoke my own wood and fire means that I am willing to tolerate a few degrees colder to save on the work it takes to acquire the fuel. Gas makes you lazy with your fuel consumption. Excellent points Brad! I appreciate the input. Reason 3 especially is probably never considered by most (myself included), but makes so much sense.